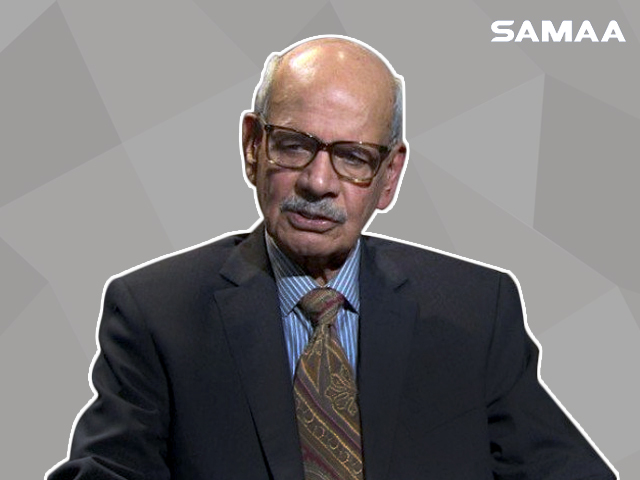 An inquiry will be held against former spymaster Lt. Gen. (r) Asad Durrani, according to DG ISPR. According to a tweet by the DG ISPR, competent authorities have been approached to place Durrani’s name on the Exit-Control List. The former ISI chief was summoned to the GHQ where he was asked to give a clarification about the controversial book, The Spy Chronicles: ISI, RAW and the Illusion of Peace that he co-authored with ex-R&AW chief Dulat. On May 22, DG ISPR Maj Gen Asif Ghafoor tweeted that the former DG ISI would be asked to explain his position on views attributed to him in the book. Durrani’s views were taken as a violation of the military code of conduct applicable on all serving and retired military personnel. The army, according to journalists who cover it, thinks that the former spymaster’s book could tarnish the military’s image abroad and would strengthen the “enemy’s narrative” globally. The book deals with sensitive topics ranging from Hafiz Saeed to the Mumbai attacks and even the Abbottabad operation. The book also focuses on the operations conducted by the ISI and R&AW. The book is in the format of a conversation between the two former spymasters who go to great lengths to give their analysis. However, the discussion of certain national security issues has irked some people in Pakistan who have questioned Gen (r) Durrani’s act of discussing what could be called state secrets in public. Some military officials and experts hold the view, however, that the army cannot take any action against its former spy chief. Brigadier (r) Saad Muhammad, a former senior official in the Pakistan army, said Lt. Gen. (r) Asad Durrani was a civilian now that he was no longer in service. “There is no such thing as a military code of conduct,” said Brig. Muhammad. However, he said Gen. (r) Durrani can be tried under the official secrets act, which is applicable to all military officials and civilians. He said that the army can summon any officer for an explanation but he thinks that nothing is going to happen in Durrani’s case as the former ISI has hardly revealed any state secret. Defence analyst Lt Gen (r) Amjad Shoaib said that what Gen Durrani has written in the book doesn’t match with the military’s narrative. He said a soldier is bound to abide by his oath even after retirement. Shoaib said the government could stop Durrani’s pension if it believes he violated his oath. However, he said Gen. (r) Durrani didn’t reveal any state secret as he retired 25 years ago. Prominent legal expert Babar Sattar agrees with Gen. (r) Shoaib. “There is hardly anything he has said in the book and there is hardly anything the army can do to punish him just because he co-authored it with India’s R&AW chief.” He said Gen. (r) Durrani could be tried under official secrets act but they will need to first establish that an official secret was disclosed.